The payday loan industry has found a new and lucrative source of business: the unemployed. ….No job? No problem. A typical unemployed Californian receiving $300 a week in benefits can walk into one of hundreds of storefront operations statewide and walk out with $255 well before that government check arrives — for a $45 fee. Annualized, that’s an interest rate of 459%….APRs in other states are even higher: nearly 782% in Wyoming and 870% in Maine. Last year, as the U.S. House drew up a financial reform bill, some lawmakers who were courted by the companies and received campaign contributions from them helped crush amendments seeking to restrict payday practices, a review by the Huffington Post Investigative Fund has found. ….The activity in Congress led the industry to spend $6.1 million lobbying Washington last year, more than twice what it spent a year earlier….Meanwhile, an analysis of federal elections records shows payday-linked political contributions are streaming into the campaigns of members of Congress. At the current rate — $1.3 million since the start of last year — the amount of money spent before the 2010 midterm elections could easily surpass the industry’s spending during the 2007-2008 presidential campaign season. 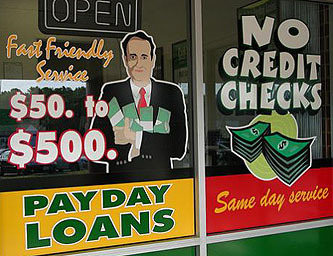 You can make up your own mind whether you approve of payday lending or not. The libertarian argument says that poor people deserve to have control over their lives just as much as rich people. Who are we to tell them they can’t voluntarily take out a high-interest loan if they’re in dire straits? There’s a rough sort of merit to this, but for my taste it’s a little too redolant of Anatole France’s famously acerbic observation that “The law, in its majesty, prohibits the rich as well as the poor from sleeping under bridges.” In fact, common sense not only allows us to make distinctions, it demands it. And common sense suggests that abusive practices that target the most desperate and vulnerable ought to be regulated in ways that similar practices might not be in other circumstances. I don’t know that I’d outlaw payday lending entirely, but would I cap interest rates and limit both the number of loans a single customer could take out as well as the total cumulative payout from a single loan? You betcha. Too bad I don’t have $1.3 million to contribute to congressional reelection campaigns.